As we have seen in the previous three posts, consumerism is the primary driver of our environmental, economic and societal problems. It lies at the root of every major global crisis, but, on the flipside, also represents the single best channel through which we can most effectively save our world. Unfortunately, consumerism is now accepted as the totally unquestioned norm in developed nations. It is completely normal and totally accepted to consume like we had five planets, leave a carbon footprint 10 times that which is sustainable, be neck-deep in debt, live from paycheck to paycheck to try and keep up with the Joneses and to seek riches through speculation instead of production. In addition, our politicians are fueling our consumerism with inflationary monetary policy, artificially low interest rates and excessive government spending. 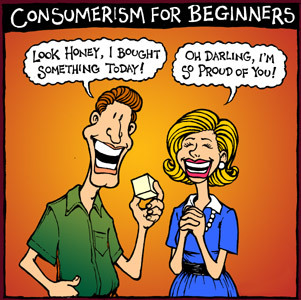 Yep, consumerism has indeed grown to become a worldwide institution. It is vital for the future of our civilization that people become aware of the hazards of unchecked consumerism. And it is even more important that people realize that consumerism is the single biggest thing standing between them and a happy, healthy and wealthy life. Please become mindful of this threat/opportunity. The series of Youtube videos starting with this one is a good place to start. You can also take a look at the summary of our sustainability crisis or the reasons why our current society is guaranteed to collapse.